Usually when I'm out and about with a sketchbook, I'm sketching places and sometimes people in places. 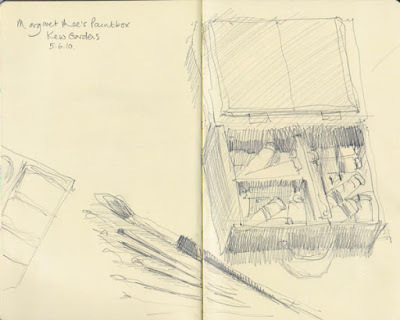 Now and again however I sketch an object which catches my attention - such as Margaret Mee's paintbox which went with her on her travels to Brazil. I was at Kew Gardens to this summer to see the exhibition of Old and New South American Botanical Art at the Shirley Sherwood Gallery - and only realised recently that I hadn't actually got round to posting this sketch of her paintbox and brushes.